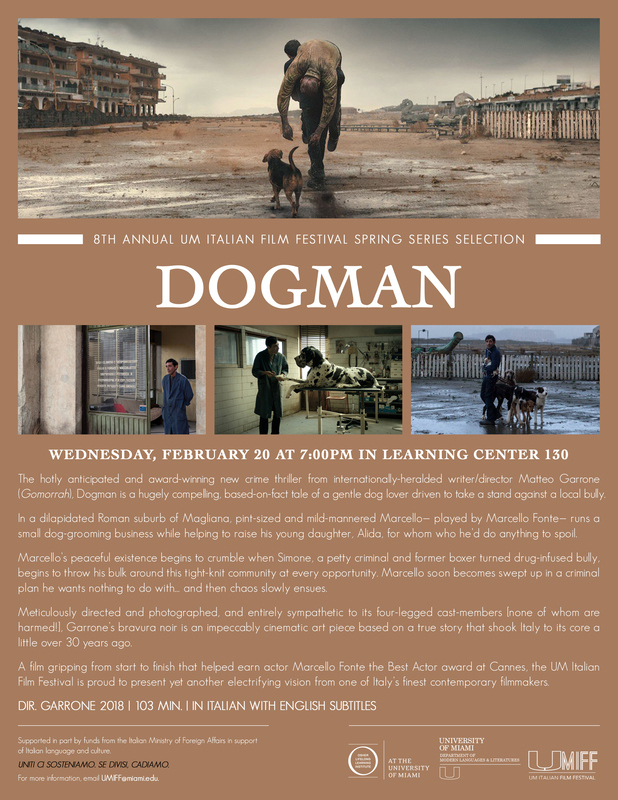 The hotly anticipated and award-winning new crime thriller from internationally-heralded writer/director Matteo Garrone (Gomorrah), Dogman is a hugely compelling, based-on-fact tale of a gentle dog lover driven to take a stand against a local bully. In a dilapidated Roman suburb of Magliana, pint-sized and mild-mannered Marcello— played by Marcello Fonte— runs a small dog-grooming business while helping to raise his young daughter, Alida, for whom who he’d do anything to spoil. Marcello’s peaceful existence begins to crumble when Simone, a petty criminal and former boxer turned drug-infused bully, begins to throw his bulk around this tight-knit community at every opportunity. Marcello soon becomes swept up in a criminal plan he wants nothing to do with… and then chaos slowly ensues. Meticulously directed and photographed, and entirely sympathetic to its four-legged cast-members [none of whom are harmed! ], Garrone’s bravura noir is an impeccably cinematic art piece based on a true story that shook Italy to its core a little over 30 years ago. 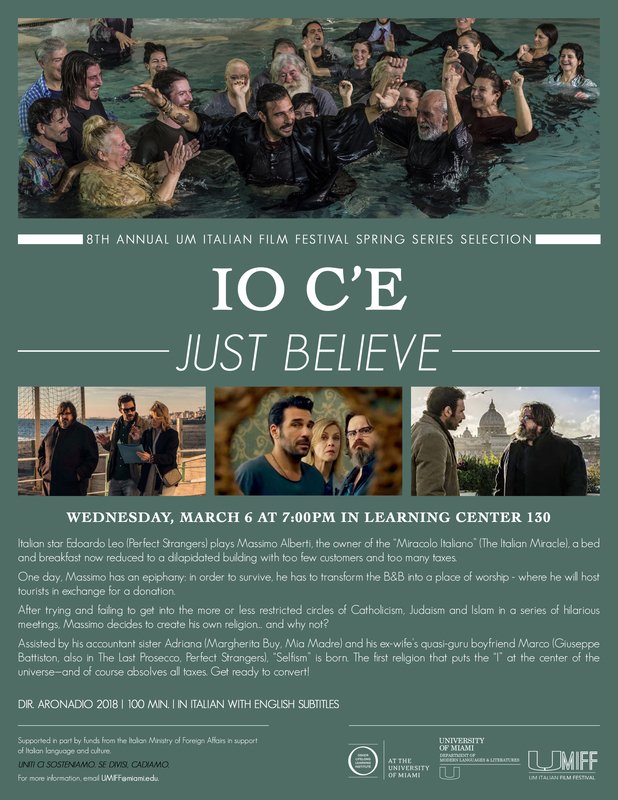 A film gripping from start to finish that helped earn actor Marcello Fonte the Best Actor award at Cannes, the UM Italian Film Festival is proud to present yet another electrifying vision from one of Italy’s finest contemporary filmmakers. Italian star Edoardo Leo (Perfect Strangers) plays Massimo Alberti, the owner of the “Miracolo Italiano” (The Italian Miracle), a bed and breakfast now reduced to a dilapidated building with too few customers and too many taxes. One day, Massimo has an epiphany: in order to survive, he has to transform the B&B into a place of worship - where he will host tourists in exchange for a donation. After trying and failing to get into the more or less restricted circles of Catholicism, Judaism and Islam in a series of hilarious meetings, Massimo decides to create his own religion… and why not? Assisted by his accountant sister Adriana (Margherita Buy, Mia Madre) and his ex-wife’s quasi-guru boyfriend Marco (Giuseppe Battiston, also in The Last Prosecco, Perfect Strangers), “Selfism” is born. The first religion that puts the “I” at the center of the universe—and of course absolves all taxes. Get ready to convert! Valeria, the young secretary of a film producer, lives a secluded life, on the same landing of an apartment block as her mother, and pens anonymous scripts for a successful screenwriter, Alessandro Pes. One day the woman is approached by a mysterious retired policeman who wants to tell her the story of a crime. Valeria is wary but captivated by his words. When she goes home she uses what she has heard to write a scenario which the producers have been waiting for anxiously: it will be Alessandro Pes’s next screenplay. The scenario goes down very well, to the point where foreign groups show an interest in financing the film and a rather elderly but revered American director is hired to make it. But that plot turns out to be a dangerous one: the Storia senza nome, or “Story without a Name”, is in fact about the mysterious theft of a famous picture by Caravaggio, The Nativity, carried out in Palermo in 1969 by the Mafia. It doesn’t take long for the consequences to surface and Valeria will find herself taking on what is an unusual role for her. Rossi, a mechanic by trade and in his late twenties, is going through a major life crisis: he is unemployed, a house in foreclosure, and a girlfriend who decided to leave him. All that he has is best friend BB, a former race car champion whose life is equally as miserable. Overwhelmed with debt and close to bankruptcy, Rossi decides to go to a bank to beg for a loan, yet due to a series of absurd circumstances, he is mistaken for a robber and flees the bank with not only a bag full of money but with a hostage named Soledad… and yes, his buddy BB not far behind. To make matters worse, it so happens that Soledad is a well-known soap opera actress, and this so-called robbery soon becomes a media sensation. And so begins a daring escapade that takes all three “bandits”— an Italian version of Bonnie and Clyde, yet with a second Clyde in tow— the entire length of Italy, from Piedmont to Puglia. 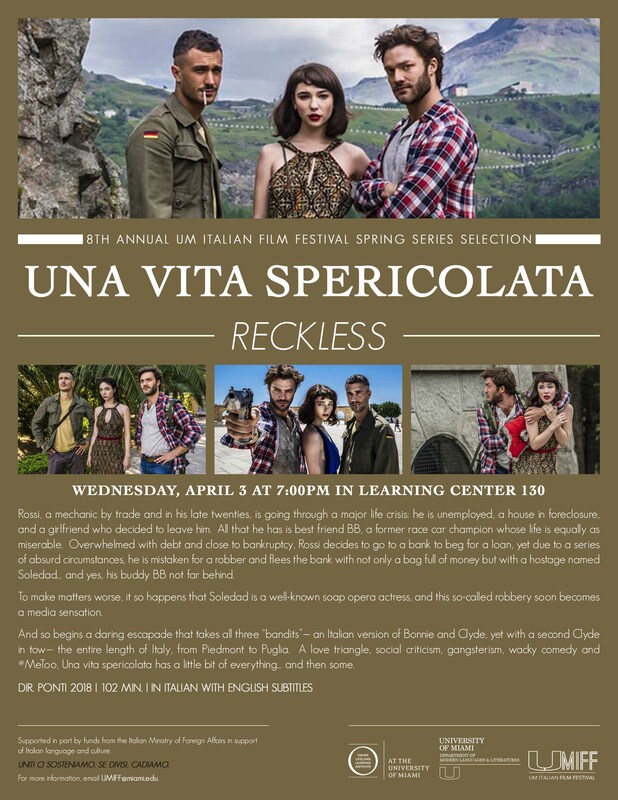 A love triangle, social criticism, gangsterism, wacky comedy and #MeToo, Una vita spericolata has a little bit of everything… and then some. After 2 years from its debut, Il ragazzo invisibile is back with the second chapter of the saga, as the young superhero Michele is now 16 and is facing all the troubles of his age. In Seconda Generazione, Michele must deal with the overwhelming knowledge of having a long-lost twin sister. He must also decide whether or not he can trust his biological mother… and just like in the first chapter of Il ragazzo invisibile, the soundtrack is a collection of “awesome” music that adds to the suspense of every scene!!! Vittoria, a shy 10-year-old girl, randomly meets a wild woman named Angelica who lives on her own in a defunct farmhouse, while at a rodeo in Sardegna. Meanwhile Tina, Vittoria’s mother, warns her not to become too involved with Angelica, yet the girl cannot resist the temptation. Vittoria slowly begins to piece together that Angelica is actually her biological mother, and this discovery sends the both adult women into a frenzied tug-of-war that pushes the trio to the edge of madness. Both mother figures are strong and have polarized personalities: Tina is a devout catholic and an overbearing parent while Angelica is a tempestuous but aimless barfly who can hardly take care of herself, let alone a child. Together, all three characters form a magnetic and divine trinity, and as the story progresses we witness Vittoria break free from her controlled and calculated home to experience the wild and unpredictable lifestyle of Angelica. Set in the beautiful but untamed landscape of Sardegna, the landscape acts as an emotional backdrop for this visceral journey to womanhood and motherhood. 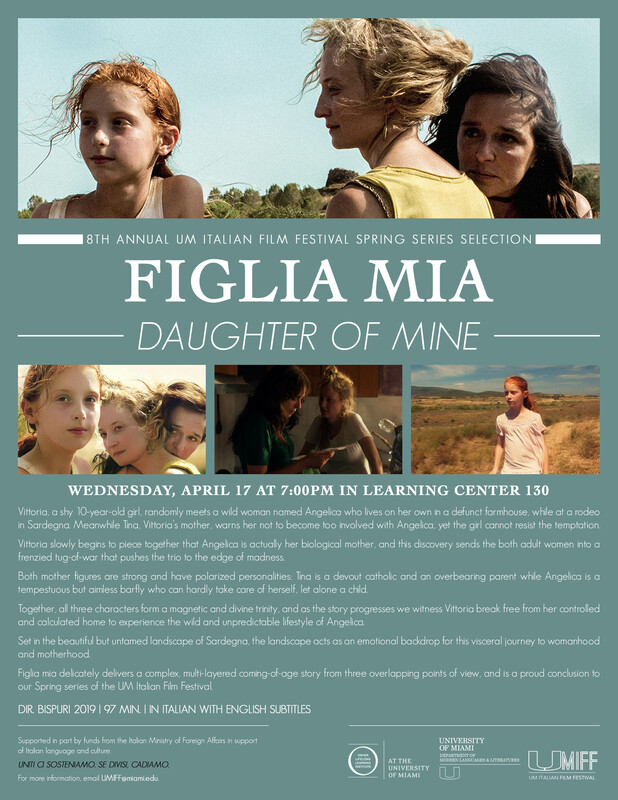 Figlia mia delicately delivers a complex, multi-layered coming-of-age story from three overlapping points of view, and is a proud conclusion to our Spring series of the UM Italian Film Festival. 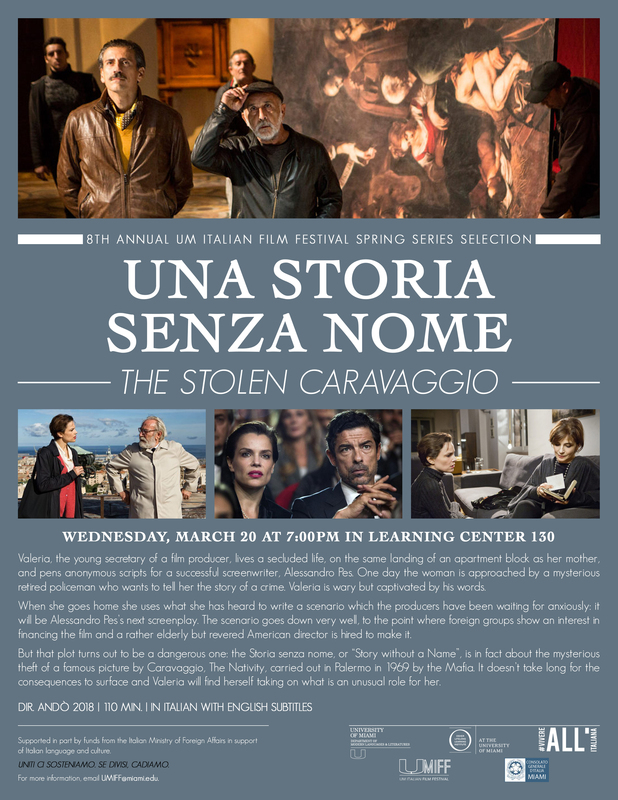 All films will be shown at 7PM in Whitten Learning Center 130 and with English subtitles.